Some sort of cushioning is typically needed to slow a piston down as it approaches the end cap. Reducing the velocity lowers stresses on cylinder parts and reduces the tendency for vibration to be transmitted to the machine or system structure. Optimised cushioning takes place when the kinetic energy is sufficiently dissipated to ensure that the speed of the piston is precisely zero when it arrives at the end of its stroke. Such an outcome helps to minimise noise and the time required for deceleration. As a result, good end-position cushioning significantly decreases the impact forces at the end of a cylinder’s stroke, playing a vital role in determining the minimum travel time and maximum speed of pneumatic cylinders. In short, optimised pneumatic cushioning can enhance the work environment and boost machine output in rapid-cycle applications. 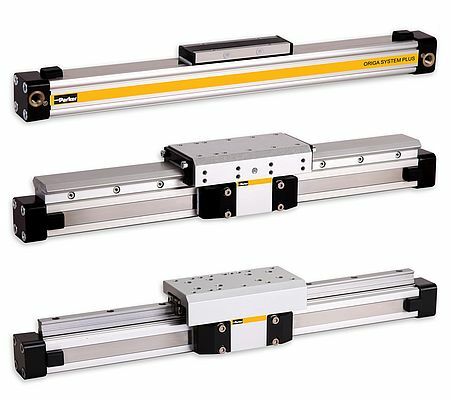 A major trend in this area is the growing uptake of rodless pneumatic cylinders with integrated cushioning, particularly where fast-cycling is required. 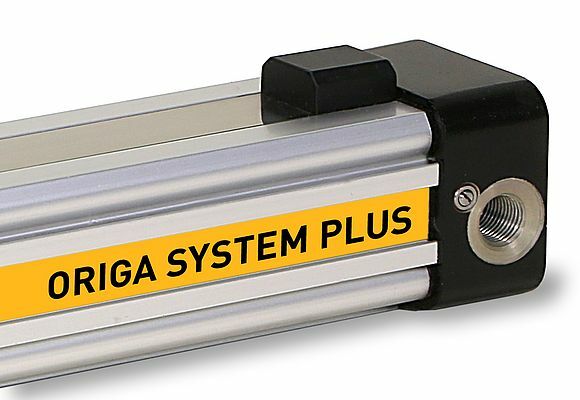 Cushioned rodless cylinders, such as the ORIGA range from Parker, provide superior life and a better machine environment, serving to decelerate the piston at the end of the cylinder’s travel, reducing internal impact force and noise, and enabling faster velocities. Rodless cylinders can today be sourced with integrated, extended end-position cushioning as standard, thus ensuring that high kinetic energies can be absorbed without the need for additional (external) shock absorbers. Until the advent of such cylinders, many machine and system builders had to specify cylinders that were larger than necessary due to the limited cushioning capabilities of smaller diameter cylinders. Although larger cylinders can absorb higher levels of energy, they do of course require larger spaces, are more expensive, and use more energy over their service life. Instead, using the latest pneumatic rodless cylinders with extended cushioning makes it possible to serve the vast majority of standard, highly dynamic applications with the smallest possible cylinder diameter. Compared to standard cushioning, the same mass can be cushioned using integrated systems with up to twice the speed. In practice, this means that in highly dynamic applications, the lifting time or cycle/stroke time can be reduced by up to 50%. Using the example of an injection moulding machine, such performance would ensure that output was effectively doubled. Moreover, thanks to integrated cushioning, it would be possible to deploy a smaller cylinder, saving on space, purchase price and energy consumption. To provide further details, the example involves a sprue picker on a plastic injection moulding machine. Here, it should be taken into account that the speed of the piston on impacting the cushioning system (according to experience) is around 1.5 times greater than the average speed. With this in mind, dimensioning the right cylinder for the application is of paramount importance. In essence, the capacity will be the end-position cushioning based on the following parameters: the length of cushioning distance; the size of attenuation cross section; and the geometric shape and dimensions of the cushioning choke. All parameters have a significant influence and must be equally optimised in order to achieve a satisfactory result. In the example, using a 25 mm diameter ORIGA rodless cylinder with a lifting sprue picker travelling up to 750 mm in length, showed that stroke time could be reduced by 50% in comparison to conventional cushioning. Moreover, the amount of kinetic energy could be increased by a factor of 4.5. In such applications, higher kinetic energy can be converted into cushioning energy, to improve cushioning. Another advantage of using this cylinder type is that any adjustment of the end-position cushioning is very simple, as is already the case with standard cushioning. Due to the fine thread and design of the cushioning screw, sensitive adjustment is extremely straightforward. In addition, an inherent loss-protection design prevents accidental unscrewing of the cushioning screw from the end cap. All the assumed benefits of standard cushioning also apply to rodless cylinders with extended cushioning. For instance, vibration-free end-position cushioning ensures that noise is minimised, while shock-free cushioning means less load on the piston and, in turn, the system. The latest rodless cylinders can also be selected in combination with highly dynamic guides or integrated fast-switching VOE directional valves.